Many electricity companies, including National Grid, have the facilities to perform some maintenance on circuits that are still live. This avoids the need to switch circuits out to do maintenance. The picture shows one technique, with access to the conductors from a bosun's chair suspended below a helicopter. 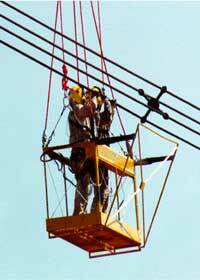 Other techniques include working direct from a helicopter, access from the pylon using an insulated ladder, and access from a "cherry picker" with an insulated arm. Once the worker is on the live conductors, they are potentially exposed to high EMFs, because they are very close to the conductors. They normally wear conducting suits, which screen them against the electric field. To ensure they do not receive exposures above the relevant limits -ICNIRP in the UK - National Grid imposes a limit on the current in the conductors while live work is in progress. The size of that limit is calculated from numerical dosimetry. National Grid funded a set of calculations specific to live-line work. The abstract is reproduced below. Phys Med Biol. 2002 Apr 7;47(7):995-1012. Magnetic field exposures for UK live-line workers. Dawson TW, Caputa K, Stuchly MA. Department of Electrical & Computer Engineering. University of Victoria, BC, Canada. Dosimetry is evaluated for live-line workers exposed to 50 Hz non-uniform magnetic fields from typical high-voltage transmission lines in the United Kingdom. The configurations involve twin-, triple- and quadruple-conductor transmission line bundles. Scenarios include three worker postures for the twin and triple bundles, and four postures for the quadruple bundle. The postures are selected to simulate worst case scenarios representative of work practices and result in highest values of dosimetric measures in critical organs. Only single-phase bundles are considered, as adjacent bundles of differing phase result only in a small reduction of the dosimetric measures. Reported data include various measures of the electric field and current density induced in tissues, as well as of the current density averaged over 1 cm2 areas normal to the current flow. A value of this latter quantity of 10 mA m(-2) is suggested as a threshold for neural tissue in the UK and international regulations. Critical tissues considered in this study include the retina, spinal cord, brain and cerebrospinal fluid. Some discussion is devoted to problems associated with the concept of current-density averaging, and two algorithms are considered. For a nominal load of 1 kA per subconductor, averaged current densities exceed the guideline bounds, only for a small number of postures and bundle configurations, in the brain, retina and cerebrospinal fluid. Non-averaged current densities in the cerebrospinal fluid exceed the suggested bound for all scenarios modelled, as well as in the retina for three postures involving a quadruple bundle.